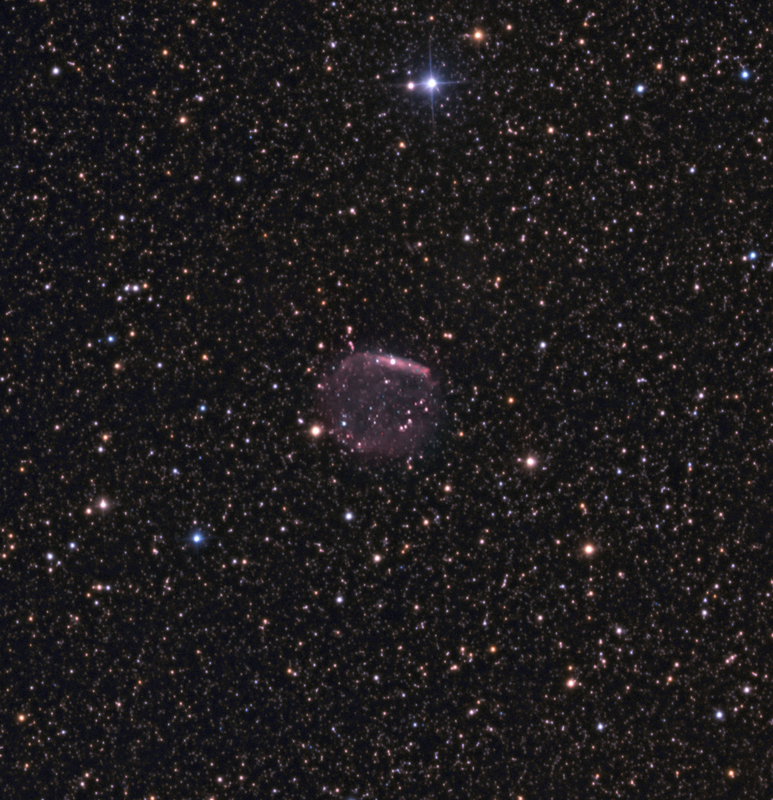 PTB32 is a small 2.4′ x 2.0′ recently discovered planetary nebula in the constellation of Sagittarius. It is incredibly faint even after collecting 17 hours of narrowband data with a 0.5 m telescope. This appears to be the first color image of the object. Frew et al (2015, Table A) indicated a distance of ~14,500 light years. The catalog name of PTB remains a mystery. P. Boumis et al. published several articles entitled “OIII Survey of Planetary Nebula in the Galactic Bulge” in MNRAS. Part I was published in 2003 and listed PTB1-25, and Part II was published in 2006 (MNRAS, 367, pp. 1551-1561) and listed PTB26-44. The authors email was listed as ptb@……. So, it is my assumption (possibly incorrect) that these objects were discovered from this OIII survey and that PTB refers to the lead author’s initials. I can find no other reference to a catalog of PTB planetary nebula. The 2006 article presented spectroscopic analyses showing PTB32 to exhibit strong signals from OIII, H-a and N[II]. As a result, 9.5 hrs of 30 min. exposures using a 5 nm H-a filter (H-a + N[II]) and 7.5 hrs using a 3 nm OIII filter were taken. An additional 1.5 hrs were collected for RGB star colors. The bright northern rim could suggest that PTB32 is interacting with the interstellar medium. Wow this is a faint one and another planetary nebula first for you and I guess the world. Also another PN naming mystery to solve?? ?